The Marquis de Lafayette (1757-1834) was a young French military officer who fought in the American Revolutionary War as a volunteer. He later became a pivotal figure in the French Revolution. Born Gilbert du Mortier in south-central France, as the younger son of a noble family Lafayette was destined for a career in the military. By the age of 17, he had obtained a commission in the army and entered into an arranged marriage. In 1776 the French government considered sending a contingent of officers to America, a plan that was abandoned after Britain declared it an act of war – however many French officers, including Lafayette, decided to participate as volunteers. In 1777 Lafayette embarked for America, ignoring orders from the French king and his military superiors and leaving behind his pregnant wife. On arriving in America Lafayette travelled to Philadelphia, where he was recommended to the Continental Congress by Benjamin Franklin. Congress granted Lafayette a commission as a major general, though for a 19-year-old foreigner with minimal English and no combat experience this rank was largely honorary. Lafayette met George Washington and the two men bonded immediately, in part because they were both Freemasons. The Frenchman saw his first combat at the Battle of Brandywine Creek (September 1777), where he acquitted himself well and was wounded in action. With Washington’s sponsorship, Lafayette was given command of his own division. He gained a reputation as a skilled commander and strategist, serving chiefly in New Jersey (1777-78) and Virginia (1781). Lafayette and his men played an important role at the Battle of Yorktown in October 1781. This, along with his closeness to Washington, made Lafayette an enormously popular figure both in America and in his native France. 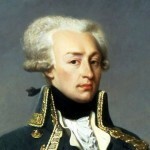 Lafayette returned to France in January 1782, inspired by the American Revolution and filled with political idealism. When the French Revolution began to take shape in the mid-1780s Lafayette was still a young man in his 20s – yet many in France saw him as a natural leader of men. In 1787 Lafayette was appointed to the Assembly of Notables, a council of important figures to advise the king on tax reform. In this position he argued for the convocation of the Estates General, France’s de facto parliament, where he served as a deputy for the Second Estate. In June 1789 Lafayette joined the newly formed National Assembly and was elected as its vice president. After the fall of the Bastille Lafayette was chosen as commander-in-chief of the newly formed National Guard. A keen advocate of individual rights, he argued for the adoption of a national bill of rights. Lafayette was probably the most significant political figure of the French Revolution between 1789 and early 1791 – however his loyalty to the king saw his support dwindle. He abandoned the French Revolution in 1792, fleeing the country and allowing himself to be captured by Austrian forces. Yet despite invoking mixed feelings in France, Lafayette remained enormously popular in America, where he returned for a triumphant tour in 1824.